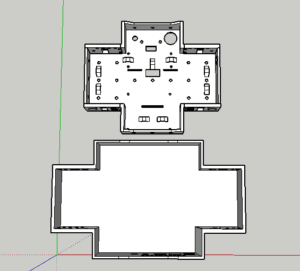 Today I began redesigning the chassis for the new robot. 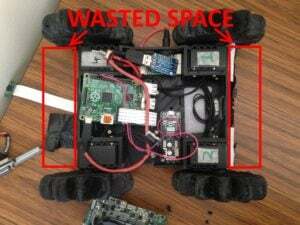 After discussing with Mr Elias, I had a few changes to the original design – the servos would be rotated 180 degrees to make enough room for the NUC, battery and voltage/current regulator. The servos were rotated along an axis that intersected the centre of the drive shaft (if that makes sense??) so that the robot would have the same footprint (when the wheels are attached) but more internal area. Trust me, it’ll be the same size – we’ll just be utilising some wasted space at the front and rear of the robot. I also added holes on the side of the chassis for the I/O of the NUC PCB. 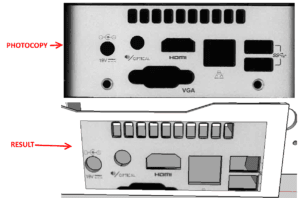 I did this by removing the NUC from the casing, then I photocopied the default case, inserted it into a texture in Sketchup, adjusted the dimensions a little, traced around the black parts with lines and ‘negatively extruded’ holes for the plugs. That’s about all for now, I’ll post progress update blogs and renders later.